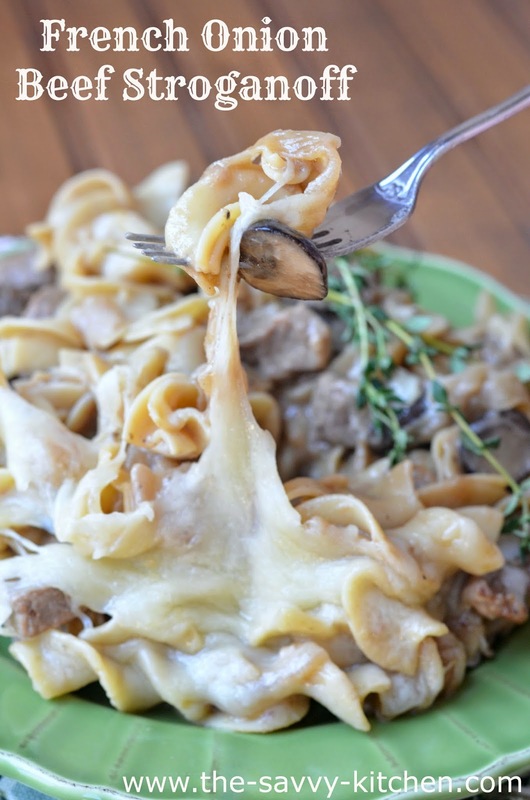 I'm sure you don't normally think of French Onion Soup and Beef Stroganoff together when planning dinner, but you should. 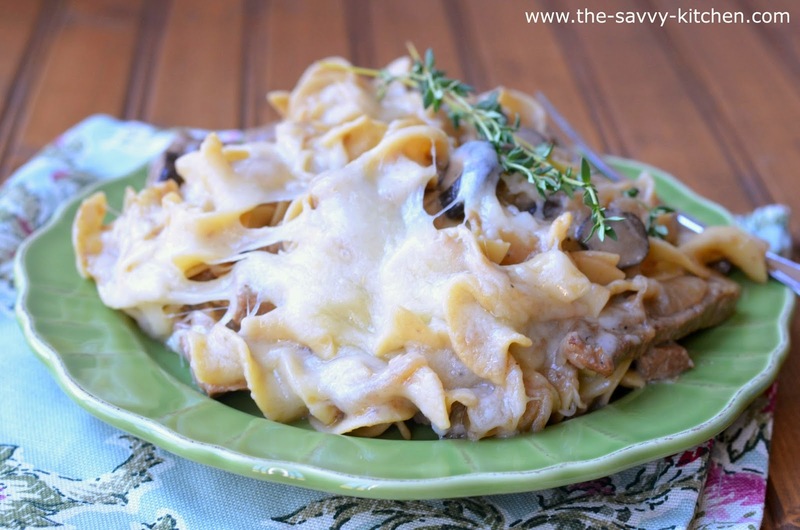 Creamy beef pasta is tossed with caramelized onions and topped with ooey, gooey cheese. So it's basically taking one amazing dish and making it even better by sprucing it up a little. It's an impeccable combination that you'll be happy you put together. Chris, Bradley and I happily devoured this and we both suggested that I make it again very soon. I'm pretty positive you'll love this as well. Enjoy! Melt the butter in a large, high-walled and heavy-bottomed pan over medium heat. Add the onions, garlic, bay leaf, sprig of thyme, and a sprinkle of salt and pepper and cook until the onions are soft and nearly caramelized, about 20 minutes. Add in the mushrooms (with a little more butter, if necessary), and saute until the mushrooms are soft and slightly browned and the onions have caramelized, about 5 more minutes. 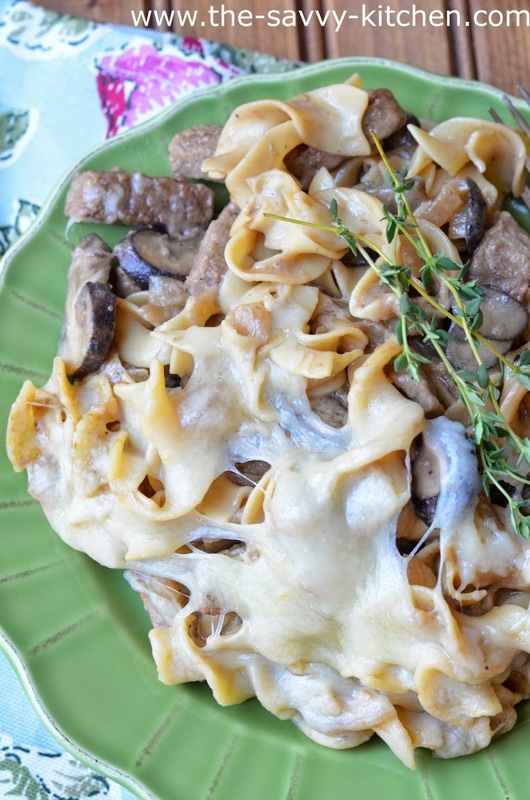 Discard the bay leaf and thyme and remove the onions and mushrooms to a bowl. Heat a tablespoon of oil over medium-high, and sprinkle the steak with salt, pepper and flour. Saute until browned, about 3 minutes. Remove the steak and set in the bowl with the mushrooms and onions. Deglaze the pan with the red wine. Add in beef broth and Worcestershire sauce and bring to a low simmer. Add back in the steak, mushrooms, and onions and let simmer, covered, until the broth reduces slightly and the steak is cooked, about 8 minutes. Remove the beef mixture from the heat and add in the sour cream, stirring well. Mix in the cooked egg noodles. Top with the grated cheese. If in a ovenproof pan, put under the broiler until cheese is melted and slightly browned. If not, leave the pan on the burner on medium-low, cover, and heat until cheese melts. Top with torn parsley and serve.